I had my triathlon today. This was the Olympic distance Marin Triathlon. 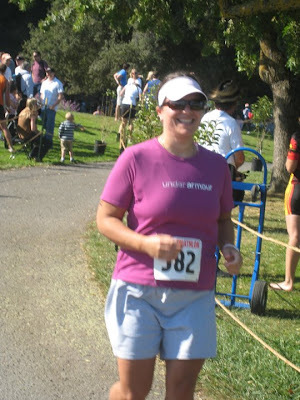 My husband's boss did the swim, a colleague of mine did the bike and I did the run. And they're off! 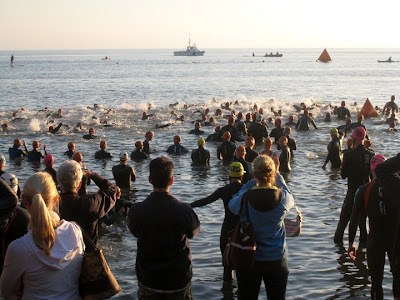 Even though I haven't done that many triathlons it was still a bit strange watching the swimmers go off without me. Miguel ran with me as an alternate in case I got a cramp or something and couldn't go on. One of the neat things about doing a relay was that we got to watch all the other folks, including the Elite racers, come in for transition. The other, as Alex and Tom can attest to, is that when you do your leg you're done. They were both happy to flop down and rest after their respective legs. I did a run/walk based on my heart rate. I kept it down the whole time. 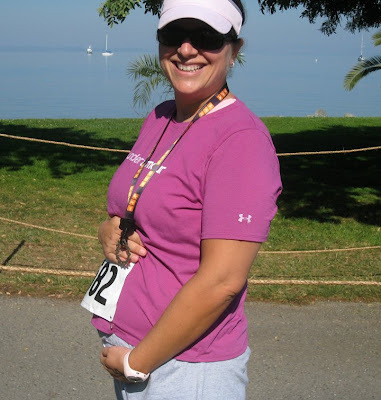 I had wanted to get a "Baby on Board" t-shirt to wear for the race but never got around to it. Even though it was the slowest 10k ever (not to mention my only 10k ever) I still had a great time. Here I am coming in for the finish. The whole event was serious about being "green" so we got neat canvas goodie bags and finisher's "medals" made from bike gears. 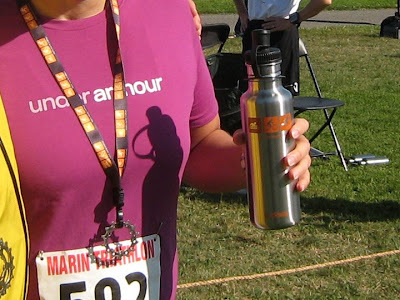 But the coolest thing were Kleen Kanteens with the Marin Triathlon logo on it! How cool is that?!! My legs got really sore later in the day. I know it's shocker but my inactivity these past few months really didn't really prepare me well! Okay, one last shot. I have to show off my ever growing tummy! !